For more than 70 years, Georgia Tech has provided a leadership role in the evolution and growth of supply chain and logistics as a field. During this time the field has evolved from an initial focus on improving relatively simple, but very labor-intensive processes to the present day engineering and managing of extremely complex global networks. 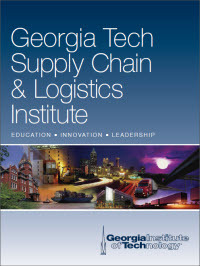 The Logistics Institute was created in 1992 by consolidating the wide range of logistics-related research and education efforts that have helped the School of Industrial and Systems Engineering at Georgia Tech establish its number one ranking among all universities. This consolidation immediately created the largest logistics research and education organization in the world. 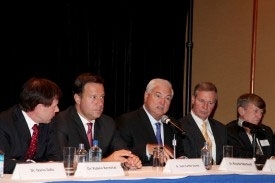 The need for a comprehensive research and education effort to address the exploding computer technology innovations that were impacting logistics was the primary motivation for the merger. 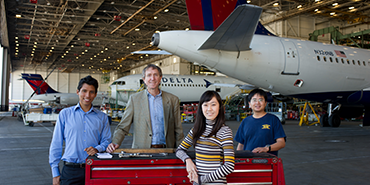 Both industrial engineering and operations research have their roots in logistics. Fredrick Taylor, who wrote The Principles of Scientific Management in 1911 and is considered the father of industrial engineering, focused his early research on how to improve manual loading processes. Operations Research began when scientists demonstrated the value of analytics in the study of military logistics problems in the 1940s as a result of the complex requirements of World War II. 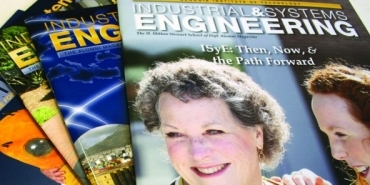 While Industrial Engineering and Operations Research have each tried to maintain separate identities, many of their biggest successes have occurred when used in an integrated framework to address supply chain and logistics issues. Increasingly this is referred to by industry as "Supply Chain Engineering." Georgia Tech's focus on logistics can be traced back to the founding of the School of Industrial Engineering in 1945. 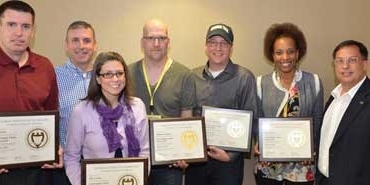 Over the succeeding 60-plus years, Georgia Tech has always had a large group of faculty who were recognized as leaders in what was considered at that point in time to be the forefront of research and education in the field of logistics. However, this "forefront" has dramatically changed in both breadth and depth over this period. In the 1940s and 1950s, the focus of logistics research was on how to use mechanization (e.g., pallets and pallet lifts) to improve the very labor intensive processes of material handling and how to take better advantage of space using racking and better warehouse design and layout. The "unit load" concept gained popularity and the use of pallets became widespread. In the mid 1950s, this concept was extended to transportation with the development of intermodal containers together with ships, trains, and trucks to handle these containers. This was a prerequisite for the supply chain globalization that was to come much later. Although the terms "warehousing" and "materials handling" were used to describe many of these efforts, this work could be viewed as fundamental applications of industrial engineering rather than as a discipline of it own. By the 1960s, a clear trend had developed in shifting more time-dependent freight transportation to truck rather than rail. This led to the need for joint consideration of warehousing, material handling, and freight transportation, which emerged under the label of "Physical Distribution." The National Council of Physical Distribution Management was formed in 1963 to focus industry attention on this area and quickly became the predominant organization in the field. Academic research and education followed this trend to satisfy the growing industry recognition of the needs in this area. This area gained much wider recognition in both industry and academia due in large part to the fundamental paradigm change that occurred during the 1960s and 1970s with regard to computers. Prior to the 1960s, virtually all transactions and record keeping were done manually. The computerization of this data opened the door to a huge opportunity for innovations in logistics planning, from randomized storage in warehouses to optimization of inventory and truck routing. The technologies, particularly those from Operations Research, that researchers had to this point only been able to examine in theoretical models had now become much closer to reality. However, there were still many difficult research issues to resolve in the transition from theory to practice. 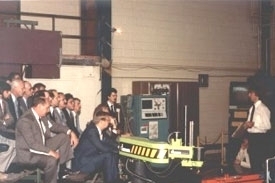 In the late 1970s and early 1980s, this led to the creation at Georgia Tech of the Production and Distribution Research Center, the Material Handling Research Center, and the Computational Optimization Center. Each of these centers was focused on a different aspect of what this new computer technology made possible. The 1980s marked the beginning of a sea-change in logistics. The emergence of personal computers in the early 1980s provided tremendously better computer access to planners and a new graphical environment for planning. This spawned a flood of new technology including flexible spreadsheets and map based interfaces which enabled huge improvements in logistics planning and execution technology. The Georgia Tech research centers were at the forefront of research for this new technology. The Production and Distribution Research Center was the early innovation leader in combining map interfaces with optimization models for supply chain design and distribution planning. The Material Handling Research Center provided leadership in developing new control technology for material handling automation. The Computational Optimization Center developed new large scale optimization algorithms that enabled solution of previously intractable airline scheduling problems. Much of the methodology developed in these centers rapidly began to find its way into commercial technology. Perhaps the most important trend for logistics in the 1980s was that it had begun to get tremendous recognition in industry as being very expensive, very important, and very complex. Company executives became aware of logistics as an area where they had the opportunity to significantly improve the bottom line if they were willing to invest in trained professionals and new technology. In 1985, the National Council of Physical Distribution Management changed its name to the Council of Logistics Management (CLM). The reason given for the name change by the new CLM was "to reflect the evolving discipline that included the integration of inbound, outbound and reverse flows of products, services, and related information." Prior to this, logistics was a term that had been used almost exclusively to describe the support of military movements. The logistics boom was fueled further in the 1990s by the emergence of Enterprise Resource Planning (ERP) systems. These systems were motivated in part by the successes achieved by Material Requirements Planning systems developed in the 1970s and 1980s, in part by the desire to integrate the multiple data bases that existed in almost all companies and seldom talked to each other, and in part by concerns that existing systems might have catastrophic failures as a result of not being able to handle the year 2000 date. In spite of some significant problems in getting the ERP systems installed and working, by 2000 most large companies had installed ERP systems. The result of this change to ERP systems was a tremendous improvement in data availability and accuracy. The new ERP software also dramatically increased recognition of the need for better planning and integration among logistics components. The result was a new generation of "Advanced Planning and Scheduling (APS)" software. Many of the concepts and tools developed at Georgia Tech were central to the emergence of the new generation of optimization-based (APS) software. However, it also became clear that to truly take advantage of the remarkable advances in computing and to address the problems of integration among logistics components required a broader focus than existed in any of the existing logistics related centers at Georgia Tech. It also became clear that there was a tremendous need to better link research, education and practice. These were the prime motivators for the merger of the Georgia Tech research and Professional Education efforts into The Logistics Institute in 1992. The widespread recognition of the term "supply chain" has come primarily as a result of the globalization of manufacturing since the mid 1990s, particularly the growth of manufacturing in China. U.S. imports from China grew from about $45 billion per year in 1995 to more than $280 billion per year in 2006. The focus on globalization accented the need for logistics strategies to deal with complex networks including multiple entities spanning multiple countries with diverse control. There has been an increasing trend to use the term supply chain to refer to strategic issues and logistics to refer to tactical and operational issues. This growing association of supply chain with strategy is reflected in the Council of Logistics Management's changing its name to the Council of Supply Chain Management Professionals in 2005. They make the distinction that "Logistics is that part of the supply chain process that plans, implements, and controls the efficient, effective forward and reverse flow and storage of goods, services, and related information between the point of origin and the point of consumption in order to meet customers' requirements" while "Supply Chain Management is the systemic, strategic coordination of the traditional business functions and the tactics across these business functions within a particular company and across businesses within the supply chain for the purposes of improving the long-term performance of the individual companies and the supply chain as a whole." 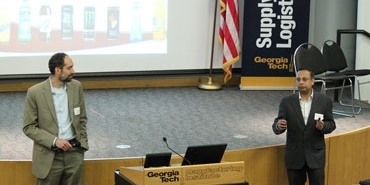 The Georgia Tech supply chain and logistics effort has grown and expanded its scope over the years so that it now includes broad expertise in supply chain strategy and supply chain management to compliment its traditional focus on the engineering issues in supply chain and logistics. These efforts have expanded globally with an established program in Singapore and developing programs in a variety of other countries. The name "Supply Chain and Logistics Institute" reflects the breadth and depth of the Institute's expanding mission of developing technology and people to address the rapidly evolving engineering and management needs of the supply chain and logistics field. Since the 1980s, computer technology has advanced at such a phenomenal rate that it is currently far ahead of the ability of the supply and logistics field to adequately utilize the new technologies. Given the extent of Internet usage today, it is hard to believe that Microsoft's Internet Explorer 1.0 was released in 1995. The communication capabilities have fundamentally changed the way we think about communications and information sharing. However, supply chain and logistics planning is still primarily based on the distributed models that came as the result of personal computers. There is no question that academic research can enable a new generation of supply chain and logistics planning technology based on centralized planning with distributed collaboration. These technology advances can provide tremendous value in addressing traditional supply chain and logistics areas such as warehousing and distribution, transportation, and manufacturing logistics. However, there are also many non-traditional areas such as health care logistics and humanitarian logistics which can get great value from building on the concepts and technologies that have already proven successful in the traditional supply chain and logistics areas. Finally, there are extremely valuable insights to be gained by systematically studying the supply chain and logistics performance of companies across multiple industries and countries. All of these are activities where the Supply Chain & Logistics Institute, in conjunction with our industry partners, will continue to provide a leadership role in research and education.